Everybody knows that Harry Winston started his career as a jeweller (and an exceptional one he still is). Thus, his watches are not only timepieces; they are exquisite works of art. Harry Winston Watches collection is a high competitive resource which never ceases to influence other designers and watch creators in the world. We can speak of a longstanding tradition of timepiece innovation and the special flair of the creator to choose the best independent watchmakers to work with and sense the value of new talents that might add to his wonderful collection of watches. Harry Winston watches are not casual though I am sure we can find several owners who would not part from a watch like that for all the tea in China. They are very sophisticated haut jewellery destined to sophisticated women dressed in dazzling designer clothes. Let us take Harry Winston’s Haute Jewellery Watches as an example. Lace, a splendid watch set with 1035 diamonds composed of an airy bracelet that surrounds a square dial is an exceptionally elegant accessory. You might even forget it is a watch and consider it the most precious bracelet you have ever had. The platinum Marquesa, an exquisite representative of the Harry Winston Watches collection, with a watch case shaped like a pear-cut diamond and composed of three rows of brilliant-cut white diamonds and four-petal flowers is so romantic and can be turned into a bracelet; moreover, the dainty adornment may be worn on a necklace if you like. This is a very daring piece that praises Harry Winston’s ingenuity and style. The Signature 7 watch, with 38 carats of exceptional diamonds is another glamorous piece in Harry Winston Watches collection, with a square dial wonderfully surrounded by its bracelet. The Semira Twirl, again a square watch with a long diamond bracelet that snakes around the wrist and may be separated to form a matching bracelet, is a most elegant accessory signed Harry Winston. Another impressive creation by Harry Winston is the Duchesse – which makes one think of what Harry Winston once said: “If I could, I would attach the diamonds directly onto a woman’s skin”. The Duchesse is a brilliant tendency to materialize his thought. With a relatively invisible setting, the watch allows the diamonds to express themselves freely. The three-dimensional form of the watch is the best example of geometric grace that you have ever seen. 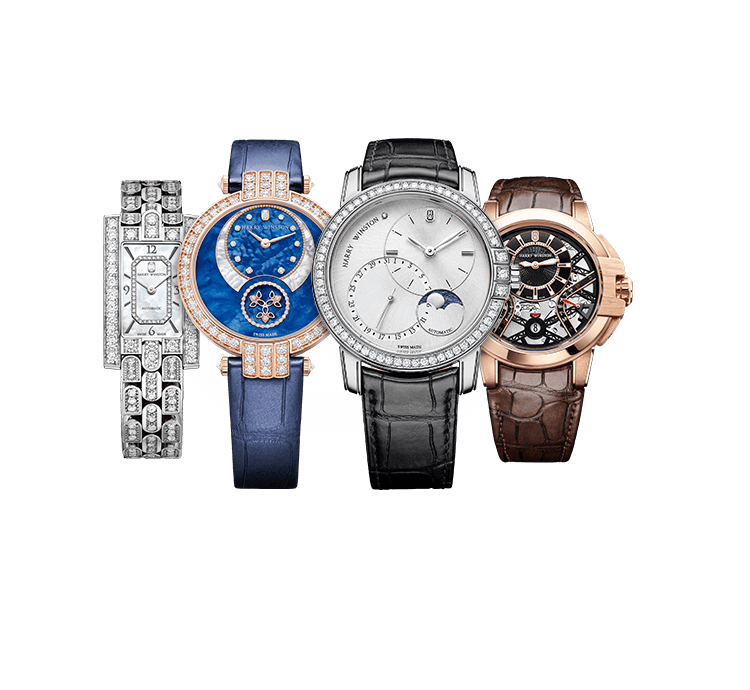 The other Harry Winston Watches collections are as elegant as Haute but look a bit more accessible. Avenue, Premier, Ocean and Haute Horology come to sustain the idea that functionality and aesthetics get along very well. Each of these beautiful works of art, full of elegance and style is meant to enchant the eye of any woman. They are wonderful examples of good taste and deep knowledge of a lady’s heart. You will always feel special with such a perfect creation around your wrist and no one knows it better than Harry Winston does. Chopard Secret: Money Well Spent?